Steam technology gets a 21st century touch as Panasonic communication systems are installed in Norfolk's steam train tourist attraction, Bure Valley Railway. Communications at Bure Valley Railway, Norfolk's very own steam railway service, have gone distinctly 21st century, thanks to the installation of a DECT communications system by Panasonic Focus Dealer, Eastern Voice & Data. 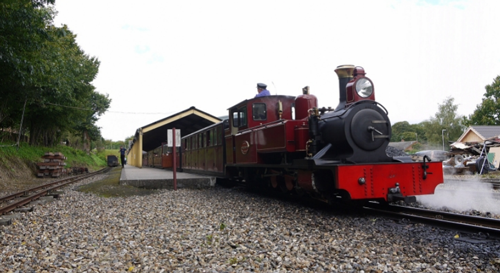 Situated deep in the Norfolk countryside, Bure Valley Railway is a key tourist attraction, being Norfolk's longest fifteen inch gauge line, running an 18 mile round trip between Aylsham and Wroxham. The railway takes up to an impressive 1500 passengers on its lines a day, and good internal communication is essential for the tourist attraction to run smoothly and provide quality customer service for tourists who come from cross the country to sample the stunning scenery. Voice & Data, a Panasonic Focus Dealer. "Previously there was no communication with other staff on trackside. What we've managed to do is provide them with full communication for all staff on trackside which means they can provide a better service to their customers." Marriott continued. A key benefit of the system is that it has achieved staff mobility for Bure Valley Railway. From senior management to train engineers, all staff can be reached via mobile handsets or desk handsets. Calls can be answered and transferred to relevant personnel efficiently, cutting down the number of call backs. The staff interconnection also means that staff can be quickly located across the premises to increase the site's operational efficiency. 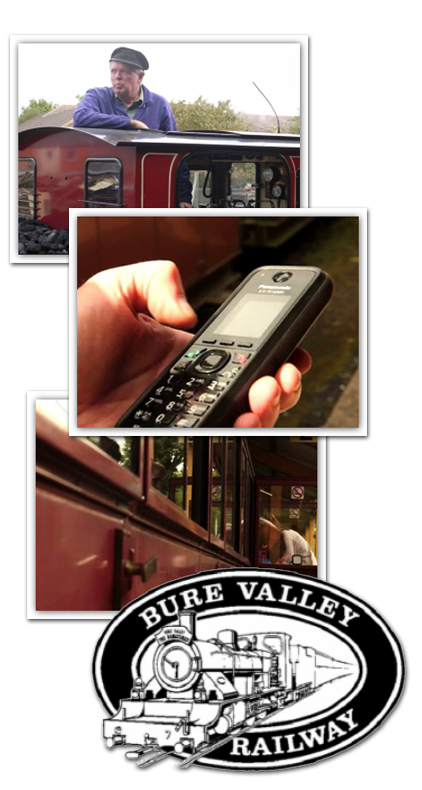 Bure Valley Railway's Train Guard, Kenneth Murrell, can be anywhere in the station whilst always being in contact with the shop and other staff by carrying his weatherproof, ruggedised DECT handset; this was previously unachievable with the fixed platform phone. "The phone system is vital for us"
Murrell said, "It's a lot better than the old platform phone because obviously we were restricted to its fixed position, whereas now we can be anywhere on the platform; the shop can contact us and we can contact the shop, so it makes it a lot easier". you can't actually leave your post, so the phone system is vital for us". Communication with the customers themselves has also been helped by the Panasonic system. When the trains arrive at the stations, the ruggedised DECT handsets are used to access the PA system in order to announce the arrival of the train. Using IP technology has enabled the far signal box, some 15 miles away in Wroxham to be connected to the main site system using a virtual private network. This has made communication with the signal box easier and demonstrates how IP technology can be employed to connect telephones installed anywhere. The move to SIP has enabled Bure Valley Railway to dispense with telephone lines that were no longer required, ultimately giving a more cost-effective solution. solution was exactly what we were after, bravo Panasonic"